Teacher Deneen Crandall at the Golden Halo Awards banquet. 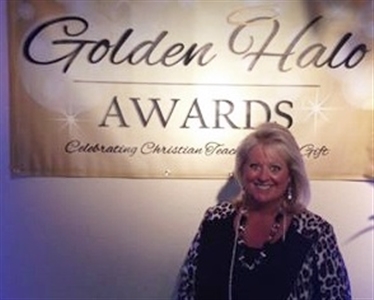 Deneen Crandall, a teacher at North Naples UMC's The Village School, has won the Golden Halo Award for grades 6-8 from the Christian Chamber of Southwest Florida. The annual award program recognizes the work of Christian teachers in Lee and Collier counties. Students are invited to nominate teachers for their ability to inspire, demonstrate Christ-like traits, help students overcome weekenesses and boost classroom morale. Crandall was among 61 teachers from various Christian schools that were nominated. Crandall has worked at The Village School for six years and is currently the director of the Multiple Intelligence Program and Robotics. Steven Noyes and Kelly Noyes from The Village School are previous Golden Halo winners. Congratulations to Deneen and to The Village School!